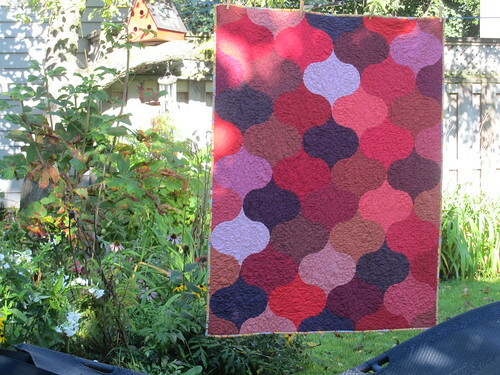 Ah, I love this quilt. 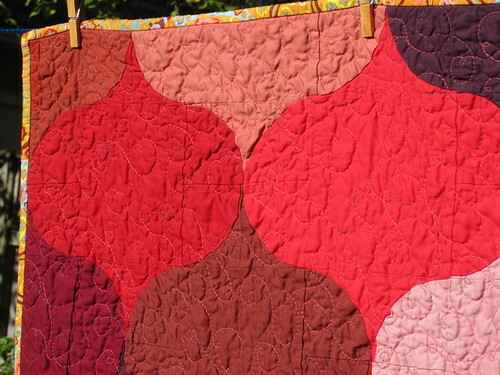 Red intensive colours and the piecing are just amazing. Mine's still slowly coming together. I actually finished most of the piecing. I need to add borders, do my applique, and back it. Just got shoved aside. But it's on the WIP list! very pretty; this design is especially effective with solids. a queen sized quilt would look fantastic! My goodness, this is a stunning quilt! What a lucky girl to be heading to college with something so beautiful! Looks so great. We drove through Kingston yesterday and had to stop because the rain, thunder and lightening were CRAZY. I was thinking that it was a shame I didn't know your address, I could have popped in to say hi- then again I would have been a soaking wet- probably not what you want to greet you at the door!! Looks great. Smashing! Very nicely done, Lesly. Luv the binding/backing for contrast. wonderful job! the student will be so comforted. I just finished a rag quilt for a 1st yr student too. Wow, I agree that the solids really work beautifully with this design! I love the lack of borders and the contrasty binding. Some great choices there Leslie! 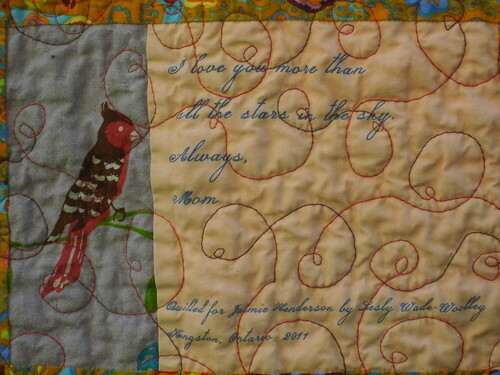 This is a stunning quilt and you did a beautiful job of it. I am sure that the recipient will love it and feel her mother's love wrapped around her. 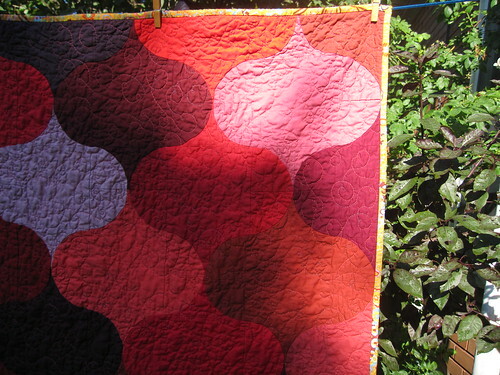 Its a very pretty pattern and you did a lovely job of the quilting. Thanks for sharing such a heart warming story. 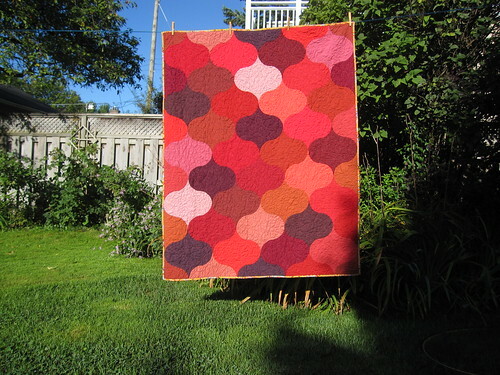 I love your quilt, it looks so great all finished! this quilt is amazing! just gorgeous! This is beautiful! 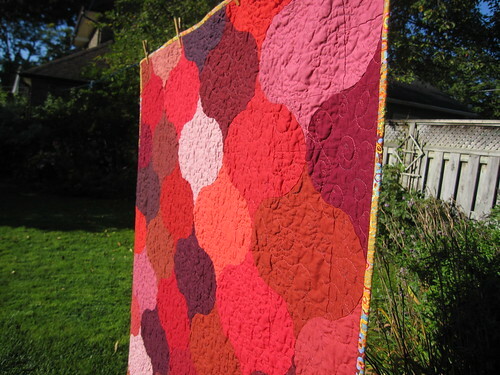 I've always been fascinated by ogee quilts - they look so difficult! I love the stay, the colors are very cute for a adolescente.Yo almost the same design I like the colors. I just love that super red hot color against the blue sky! 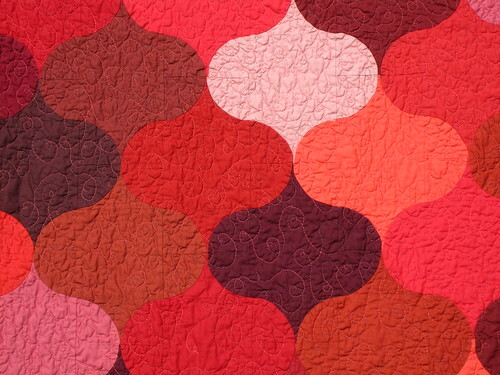 What a HOT quilt! What a beautiful quilt, so much skill must have gone into the making of this with the curved piecing and the exquisite quilting. Wow. That is amazing. Great job with the colors!! 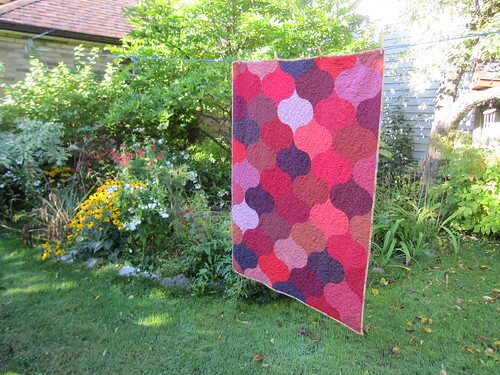 I can`t tell you how much I love this quilt - so beautiful! 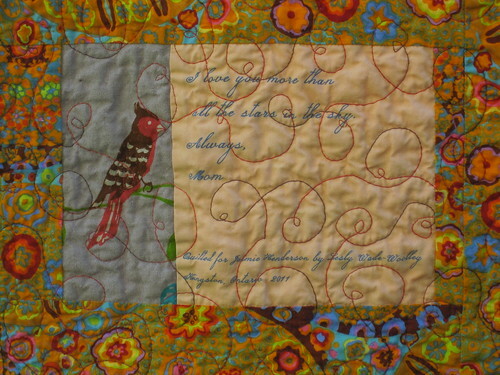 I just love this quilt!!! It is so beautiful!! I love the reds!!! You did an amazing job with it!!! That quilt is 'sew' lovely. I am in love with this pattern. Definitly adding it to my 'to-do' list, LOL! Gorgeous! I am thinking I would love to try one in blues.thank you for the inspiration.